Home » WWF » What does WWF do? The first, is to ensure that the earth's web of life - biodiversity - stays healthy and vibrant for generations to come. We are strategically focusing on conserving critical places and critical species that are particularly important for the conservation of our earth's rich biodiversity. The second, is to reduce the negative impacts of human activity - ourecological footprint. We are working to ensure that the natural resources required for life -land, water, air - are managed sustainably and equitably. Through innovative partnerships that combine on-the-ground conservation, high-level policy and advocacy, and work to make business & industry more sustainable. We are strategically focusing on conserving critical places andcritical species that are particularly important for their habitat or for people. We are also working to reduce humanity's ecological footprint – the amount of land and natural resources needed to supply our food, water, fibre and timber, and to absorb our CO2 emissions. It's not about keeping people out of nature. Or turning back the clock. Or preventing countries or communities from developing. It is about finding practical solutions for a healthy planet. A planet where people and nature can thrive together, in a stable environment, now, and for generations to come. The great Ganges-Brahmaputra River Delta of Bangladesh and India. As the rivers empty, they carry large quantities of sediment into the Bay of Bengal. 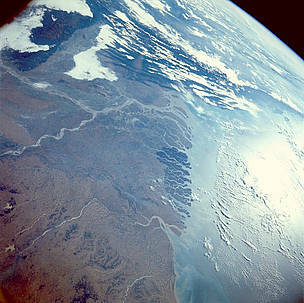 The delta (center of the photograph) is over 220 miles (350 kilometers) wide along the Bay of Bengal. The darker colored mangrove forests of the Sundarbans, a great wilderness of swamps, dense timber forests, small islands, and tidal creeks covering 6526 square miles (16 900 square kilometers), occupy the middle of the delta. 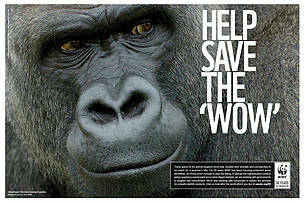 Reduce humanity’s impact on natural habitats. The decisions, actions and inactions of one species – ours – over the next decade will determine the fate of all life on Earth. Across the world, biodiversity and natural habitats are disappearing faster than ever before. Why? Because as a whole, people are using wood, water, wild animals and other natural resources more quickly than they can be replenished, polluting and altering natural habitats, and changing the entire planet's climate. This is damaging the ecosystems that supply us – and all other life – with freshwater, food, clean air, shelter, and more. Millions of people, in rich and poor countries alike, are already feeling the consequences – uncertainties over food and water security, increased vulnerability to natural disasters and diseases.